Cargotecture isn't just for yuppie do-gooders with a penchant for recycled materials and contemporary architecture. Those interested in hunting and fishing can also take advantage of the modular characteristics, ease of use and the plug-and-play capabilities of shipping containers. Just because their decor may not meet the taste of most readers of Dwell magazine, doesn't mean this house stacks up any less in terms of sustainability. In fact, the home is made from two shipping containers and comes complete with a composting toilet, solar photovoltaics, solar hot water, biomass heating, and vintage decor. Although it’s not clear whether the home was designed by an architect, it appears to be a clever project that make efficient use of space. 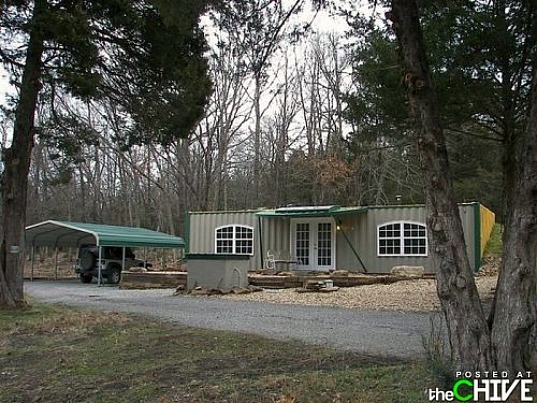 The Chive has tons of pictures of the construction of the home – from the containers being dropped on the lots and buried into the hill all the way through final construction and the addition of furniture and decor. Two containers were set next to each other, and a large arched hole was cut in-between to connect them together and create a larger living space. The interior was framed with 2×4’s then insulated and paneled with wood, and double-paned windows were installed on 3 sides. The two-bedroom, one-bath house features a composting toilet to save water and makes use of both photovoltaic panels and solar hot water heaters to reduce energy demands. The home is partially buried into a hill in the back, which helps moderate interior temperatures while a wood-fired stove provides heating. Although we’d certainly have liked to see a skylight or two for more daylighting, the resident’s hunting trophies are at least adequately lit. Vintage and antique furniture pieces pair nicely with the camo decor, creating unified redneck aesthetic. FELICIDADES, ESPERO LOS DEMÁS BOLETINES ESTÁN MUY BONITOS Y BIEN REALIZADOS. So do I. I am planning one with two containers and a gap in between and built for tropical weather. Although it's not clear whether the home was designed by an architect, it appears to be a clever project that make efficient use of space. The Chive has tons of pictures of the construction of the home. The pictures show everything from the containers being dropped on the lot and buried into the hill all the way through final construction and the addition of furniture and decor. Two containers were set next to each other, and a large arched hole was cut in-between to connect them together and create a larger living space. The interior was framed with 2x4's then insulated and paneled with wood, and double-paned windows were installed on 3 sides. A look into the tiny kitchen and dining area. The home makes use of both solar pv and solar hot water to reduce energy demands. The two-bedroom, one-bath house features a composting toilet to save water. 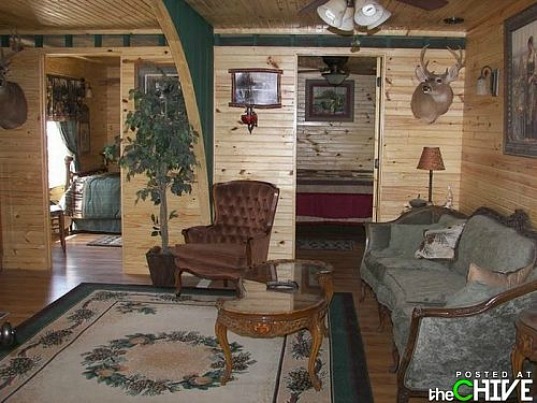 Hunting and camo decor are consistent throughout. The construction of the shipping container home. Paint on the exterior shows where the windows should be installed. The home is partially buried into the hillside.